Using all those professional tools that consume a lot of time might be a sound choice, but you can only do this when you’ve got a good grip on the tools like Photoshop, etc. However, there are many other things that you can try to remove all those undesirable logos, graphics, or unwanted stamps on your pictures. 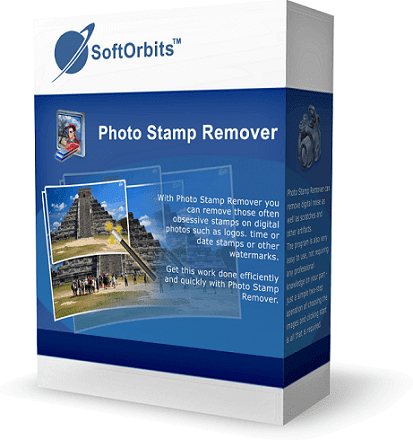 SoftOrbits Photo Stamp Remover is the most recommended tool to do the job. I’ve been this tool for weeks, and now I’m reviewing this for everyone who encounters the need for such utility tools. So let’s start the review of the Photo Stamp Remover, and why it is recommended. It is a premium software, but the company offers a trial version for every user to try out all the amazing features that the tool comes with. You can download the trial free from the official website of SoftOrbits. It will take just a few seconds to install and run the tool on your system. The software is compatible with the latest version of Windows 10 and only requires minimum configurations to run. The interface of the tool is fresh and pretty minimal. 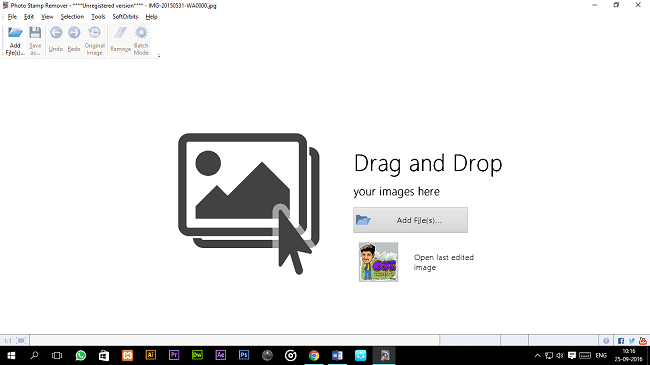 You can load the images in the workspace with either the folder browser or drag and drop feature. The one thing that makes it intriguing is the home window screen. The tool greets you with a very simple Drag and Drop interface, and you can start using the tool directly from the home screen. There is a toolbar on the right which provides you with available options to remove photo stamps, like Free-Form Selection, Deselect, Rectangular, Selection by Color, and the Marker. 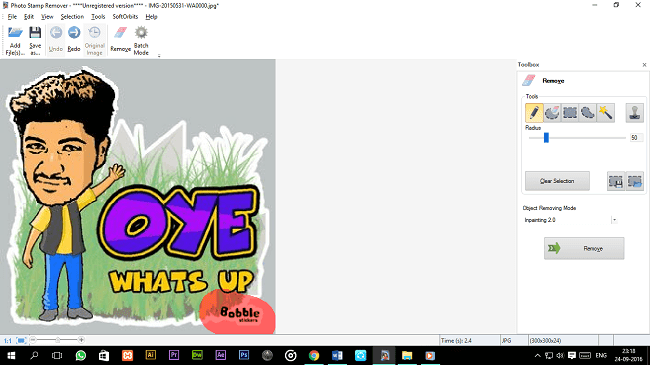 I used the tool to remove a small logo from a graphic image naturally, and I was shocked at the moment. Before using the Photo Stamp Remover, it used to take me hours to perfectly suppress the image and clone the background using Photoshop. However, this tool did the job in a minute. All you need to do is to indicate the dates, logos, or stamps and the software removes it automatically. Photo Stamp Remover has imbibed the recovering technology, which enables it to fill the blanks in the image with the surrounding text and graphics. The edited spot gets perfectly merged with the rest of image in few minutes. The batch mode also lets you do the task for multiple files and folders so that you can save time with this tool. You are entitled to zoom in and out of the images whiles editing and previewing them in the main window. The selection tool and adjustment radius options allow specifying the range of the area to edit. Also, you can remove the dilation, haziness, and blurriness using the conceal tool, and other options. SoftOrbits Photo Stamp Remover seamlessly supports almost every standard image format for editing purposes. The tool supports JPG, TGA, PSD, BMP, TIF, ICO, and some other file formats too. I was pretty excited when I got to know that this tool also supports Photoshop PSD files. Easy on Computer Memory: – The tool requires small memory and runs seamlessly on devices with small configurations as well. I used the tool along with the After Effects and Photoshop, and surprisingly Photo Stamp Remover ran smoothly in the background. You can quickly toggle between the original image and the edited image let me preview all the changes that needed to be done on the picture. You can easily save the images in different formats during the editing session as well. The program can remove a big range of unwanted objects, for example, people, objects, undesirable artifacts, skin imperfections etc. So, how much this tool charges you for all these premium options and compelling features? The standard version or the paid version costs only $24.99 to license the free version. You can purchase the software directly from the SoftOrbits website with 70% discount. The company offers reliable support for all the customers and documentations to use the tool up to its full capabilities. You can get more information about this tool and much other software from SoftOrbits here. Though the batch mode was supposed to do the job on multiple photos, unfortunately, I had to edit each and every picture individually. However, the tool quickly loaded the multiple images at once. Simply download the software from here. You can get giveaway promotion key during the installation process. Just click on Get free activation key. It will redirect you to the official website. Now, just enter your email address and hit Request full version key button. You’re done. Without updates and reinstalls after expired activation date. You can also opt for SofOrbits Digital Photo Suite which provides data solutions for retouching, resizing, converting, protecting and publishing your digital photos. Photo Stamp Remover is already included in the package. Other than Photo Stamp Remover there are 9 more tools embedded in Digital Photo Suite. The effortlessness of using the SoftOrbits Photo Stamp Remover, to remove unnecessary stamps, and logos from the pictures is undoubtedly the feature that makes it the best amongst its competitors. The tool is a premium one, but the company recommends you to try out the free version first. It will give you a glimpse of all the amazing features that the tool offers. So this was my take on the Photo Stamp Remover, and now it’s your turn to let me know what you think about this tool. Cheers! Previous articleAdidas Snapshot: Aplikasi Sepakbola Pengasah Skill!